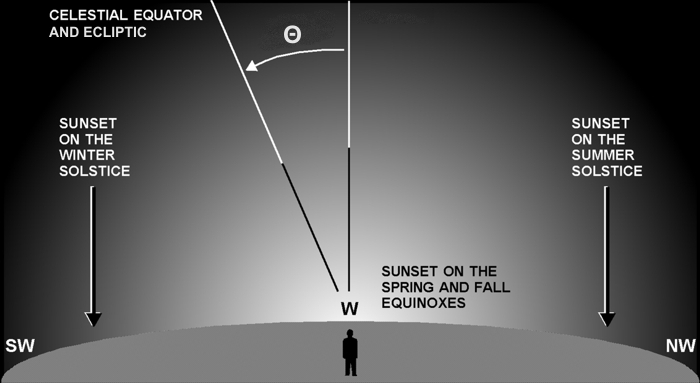 The Autumnal Equinox (aka Fall Equinox) happens on September 23rd this year. Other years it happens on the 22nd. Reason is, the Equinox is a point in time defined to the second, and there’s two dates on the Earth at any given time. Thus, an Equinox is not really “all day” as stated above. At the instant the slowly drifting Sun crosses the plane of Earth’s Equator, an Equinox happens. This year the exact time is 9:04 UT. To see your local time in UT, go here. The plane of Earth’s equator, projected on the sky, defines the Celestial Equator, an imaginary circle dividing the sky into north and south hemispheres. Just like how Earth’s geographic Equator divides the globe. The Celestial Equator runs from the West to East horizon points, at an angle equal to your latitude (the angle labeled Θ in the graphic). The Ecliptic, or path of the sun, is also an imaginary circle in the sky, but it moves in a complex manner. The points where it intersects the western and eastern horizons slide north and south by an amount that depends on your latitude. It also changes its tilt by ± 23½° as the seasons go through Spring, Summer, Fall, and Winter. On an Equinox, the Ecliptic coincides with the Celestial Equator. Each day now, the Sun will set (and rise) farther and farther south, resulting in shorter days, longer nights, and less direct sunlight. This trend will reverse on the Winter Solstice (in December), after which the Sun begins its drift back north into Spring and Summer. Excellent explanation, great article as always.